They just bought their first house, they both work full time, they take care of two dogs, and they are planning a wedding. But even so, Natasha did not hesitate for a second when I suggested, on Saturday evening, that she be a guest on the radio show at noon on Sunday. When I arrived for the show, they were already at the station with big smiles on their young faces. I couldn't help smiling, too, at those contagious grins. Natasha told me that she was a bit nervous, so I suggested that she pretend we are on the phone together (which we were a lot for the past month!) Luke said she does that well…and so do I. It was a fun show and I think their enthusiasm came through on the air. 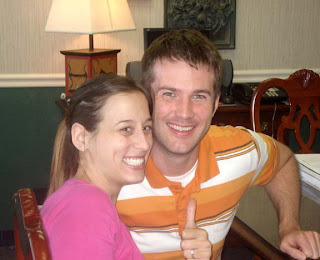 Now that they have their home, Natasha and Luke will be concentrating on planning their wedding in a couple of months. 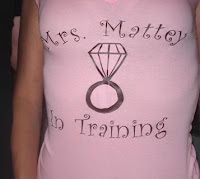 Don't you lover her T-shirt? They have my orders to live "happily ever after," and I believe they will. It could be one of those summer mornings in Baltimore that promises a hot day ahead. Or maybe it's just clear and not too windy. We don't need much of an excuse to head acro ss the Chesapeake Bay for breakfast. 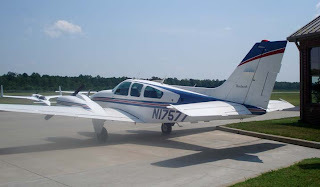 If we drove, it could take a couple of hours, but we share twin engine freedom with some friends, so four of us climbed in and took off for a short hop to Kay's Country Kitchen in Cambridge, MD. 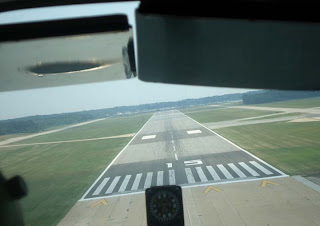 Dorchester County on Maryland's Eastern Shore is home to Cambridge Dorchester Regional Airport. 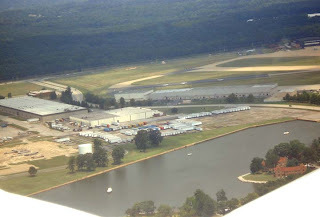 Like many small airports across the country, Cambridge Airport has a restaurant. Part of the fun of making day trips is discovering new places to eat where other pilots gather. In fact, the guys only fly to airports that have restaurants...and the food and the company are wonderful. Good service, very inexpensive and delicious, just like at Kay's. If you're traveling through Cambridge, you'll find it well worth a stop at 5263 Bucktown Road in Cambridge (410-901-8844). What I like best is that a quick getaway like this is a perfect Type E vacation. Different scenery, different people, and in the company of friends – it's refreshment and relaxation packed into a short time. Perfect! As a first time homebuyer who isn’t overwhelmed? As a young girl in love I wanted to find my castle to share with my Prince Charming (or for those who know the Princess Bride, my Farm Boy). I felt on top of the world knowing that I had the support from my now Fiancé, Luke. We decided to try and buy a house by ourselves, without a Realtor. Well, to make a long story short, that didn’t pan out quite how we expected. We ended up houseless in an apartment we had to move out of in about a month. This left us desperate and with no idea where to start. Thanks to my mortgage broker, Bob Bennett at Maryland Mortgage Solutions, he insisted we contact Margaret Rome. Well this turned out to be the biggest blessing we ever encountered. At 23 years old, overly stressed trying to plan a wedding and no idea where to start, I left a desperate message for Margaret asking for her help. Not 30 minutes later did I receive a phone call from the most reassuring voice I had ever heard! I started to have some hope. There was not one second in any conversation I ever had with her that she wasn’t concerned with what Luke and I wanted and what we were looking for in a house. I was so excited to meet her in person two days later and we hit it off as though I had known her for years. Margaret set about researching homes all around Baltimore City and Baltimore County trying to make our dreams come true in a very short time frame. She told me from the first conversation I had with her, “I will not sell you a house, you will find the house you want, and I’ll try to convince you not to buy it, and when you find a house you hate, I will try to convince you to see the positives in it.” Well, that she did. Never once was she pessimistic or optimistic, just the Devil’s Advocate, which is probably what helped this process move along so seamlessly. Finally we found a house that my Fiancé loved and I couldn’t quite decide if was right for me until Margaret started talking. She helped me to take a look from a relatively non-biased stance. 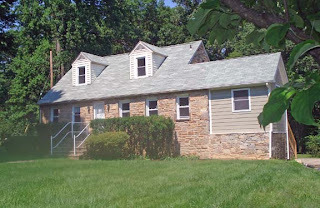 It turns out this house was the perfect compromise between the two of us; energy efficient for him, and had quirky characteristics of an older historic house for me, with lots of land and a tiny little stream in the back for our two dogs. We thought we had the world in our hands until the negotiating started. Keith Whitehead, our brilliant home inspector, came out and brought up some small issues that needed to be fixed and some larger ones as well. I was a little nervous considering our offer was approved and we were set to close within a few weeks. Margaret never let me get upset. She just kept telling me, “Natasha, don’t worry, I WILL get this taken care of,” and she always did. She helped make this process as easy for us, the buyers, as possible. She never once let me second-guess us getting everything we wanted with this house. It helped we had the best team: Merle Intner - Appraisal Services of Maryland, Charlie Brubaker - Command Pest Control, Mike Quartner - Quartner's Heating and Air Conditioning, Keith Whitehead – Home Advantage Home Inspections, Bob Bennett –Maryland Mortgage Group, and Tom Dreschler – Sage Title Group. Two days before closing we decided to go back to the house and make sure everything was in order. Well, everything looked perfect until we stepped inside and the house was 90 degrees with the “air conditioning on.” I was about to have a nervous breakdown because how can you get this all fixed? Well, Margaret called in her big guns and had her favorite HVAC guy show up and give us estimates and tell us what needed to be done. 48 hours later we were fully prepared to go to closing. We got to closing at Sage Title Group in Towson; Margaret and Bob Bennett were there, and a few minutes later Tom Dreschler, the attorney who worked with us, came in. From the minute he started talking you could see that he was only concerned about making sure everyone was happy and comfortable that the closing contract was fair to everyone. He did all the research and made all the phone calls necessary to make sure that there would be no favoritism in any wording or paragraphs added to the contract. He double, triple, and even quadruple checked with everyone to make sure every party was happy. Being a first time homebuyer, of course I was overwhelmed, but everyone there made sure we were at ease before we “dotted our i’s and crossed our t’s.” One of the many words of advice Margaret told me at the closing was “The key to having the best closing is to have everyone leave filling as though they sacrificed a little.” I wasn’t quite sure I understood what she meant until we signed the last line, and I realized that, had we gotten everything we wanted, we would have devastated the seller, and would have come out looking greedy. Needless to say, we got the house that is perfect for us, and we are so excited to make it a home. I think the proudest moment Luke and I had was pulling into the driveway of our new home and seeing the SOLD sign out front. However, I am sad at the fact I can’t look forward to hearing from Margaret calling every morning to give us our daily updates, and we can’t go explore more houses and discuss our visions of what it can become. I can tell you however, that I am excited for the day we decide to sell our house when I have no doubt that Margaret Rome will be our first phone call. Good luck and happy house hunting. I can guarantee you that with Margaret you will find the perfect house. Recently someone challenged me to sum up my life in just six words. My reaction was, "You're kidding, right? 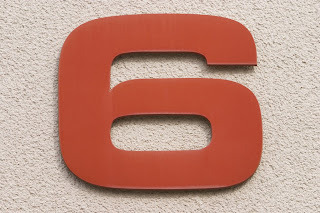 Choose just six words to sum up this whirlwind that is my life? Ha! Waaay too many choices." So I've got a better idea – here's a list of six-word summaries. Take your pick! Made a wish, Lee came true! Have to dress - time for Radio! Don't let unimportant things become important! I just do not do upset! What's Important Now is important now! I guess it's a Type E thing – ideas bubble up, and I don't see any reason to choose just one and discard the others! 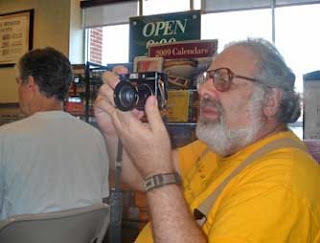 I went one Saturday recently to a book signing at Barnes & Noble in Ellicott City. My friend's husband introduced his son Gary Marcus...well it was sort of an introduction, and a bit of kvelling, and maybe a bit of embarrassing praise for this very personable and very brilliant young man. Gary has a long list of accomplishments including graduating high school at 15 or, as Phil Marcus says, he dropped out of high school to go to college. He graduated from Hampshire College in Massachusetts and went on to get his Ph.D. at MIT. Now he's a professor of psychology at NYU. 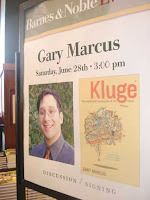 Gary's book is Kluge: the Haphazard Construction of the Human Mind. He explained that a kluge (pronounced klooj) is "a clumsy or inelegant solution to a problem." Think of McGyver using duct tape, a piece of wood, and a bit of wire to create a weapon and defeat the villains. Gary was quite entertaining with his examples of kluges which he describes as poor design, using as an example the human spine. How many people have back pain? Almost all. Now the spine was a perfect design for four legged creatures, but evolution has no foresight or hindsight, and has to work with what is there. So the humans wound up with the same spine meant for walking on all fours. Another example of a kluge is the "clumsiness'' of the human mind. For example, we have trouble remembering things: "Where the heck are my car keys? Where is my car?" Unlike computers, we don't have erasers in our brain. So if we go to work each day and usually park in the same place, but then one day park somewhere else, when we come out we cannot remember the location of our car on that day. Gary learned to put his car keys in the same place to help with this particular clumsiness. He talked about the skydiver who on the first jump has only one thing to remember. PULL the cord! 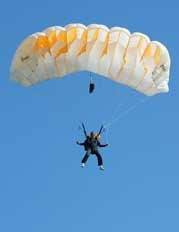 But 6% of skydiver deaths happen because divers FORGET to pull the cord. That is why pilots are trained to use checklists for everything – we cannot trust our memories. The computer does not forget; every bit of data that goes in has a time stamp and an assigned location. The brain has no time stamp, and can't go to a specific location to find information but has to make do with a system that was kluged together from what nature had available. Some people think the computer is smarter than the human, but not so. Humans create the GIGO (garbage in-garbage out) programming. He gave an example of a GPS in England that did not take into account that the roundabouts (traffic circles) go in the opposite direction from what we are used to. The computer in the GPS did exactly what it was programmed to do! He also talked about how humans can be manipulated by understanding that our mind is not perfectly designed for rational thought. When you call the estate tax by another name – "Death Tax" – it becomes something horrible. The tax hasn't changed, but the perception has. Gary talked some about marketing and how our minds can fool us. In a grocery store, when they say "Limit 12" on a product, people purchase in larger quantities than they need. Normally they might buy one or two of the item, but with the limit they buy 6! Gary was charming and interesting and had an attentive audience. Unfortunately, the setup was a kluge itself – a poor choice of location by the front door with people coming and going, the buzzer going off when merchandise was not checked out properly, a vacuum cleaner or some such noise. And me, I got a phone call at the end, had to leave, and forgot to buy the book. I went to the signing to hear Gary, buy the book, have him sign it, and to see my friend. But my friend wasn't there because she had to go to a family graduation at the same time which I didn't know because my email was out. I forgot to buy the book and get it signed. At least I found the car when we left!